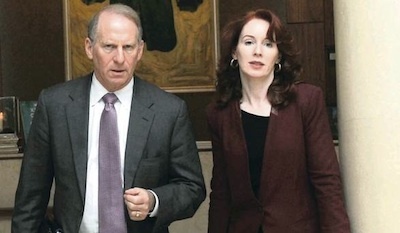 The former US peace envoy and his assistant, former US national security adviser Meghan O’Sullivan, have been involved in weeks of multi-party negotiations with the North’s main political parties. The talks were considered necessary after local politicians failed to deal with loyalist protests and riots earlier this year. Those disturbances followed a city council vote over a year ago to restrict the flying of the British Union Jack flag over Belfast City Hall. Strong differences over justice and victims’ issues have remained undimmed since the signing of the 1998 Good Friday peace agreement. Sectarian parades through Catholic neighbourhoods have also continued to provoke confrontations and violence every summer, and increasingly, year-round. Earlier this week, the DUP rejected the initial three-stranded talks blueprint presented by Mr Haass. Party leader Peter Robinson said that, had it been the final paper, ‘steam would have been coming out of his ears’. In particular, he the proposals tabled on flags would have been ‘a step backwards’ for his party. Sinn Fein’s Gerry Kelly dismissed what he said were unionist dramatics. “Just because we are seeing histrionics out in front of the cameras doesn’t necessarily reflect what’s happening in the rooms,” he said. The principle unionist objection was against a suggestion by Mr Haass to fly the Irish national flag over Stormont on certain rare occasions, such as a visit by a 26-County political leader. Following unionist objections, however, that was quickly thrown out, and a revised version of Haass proposals was emailed to parties by the talks chairman on Thursday. But the possibility of reaching a substantive agreement on all three issues before Christmas is beginning to look remote. Mr Haass met with each of the five Executive parties individually this [Friday] morning before bringing them all together for a round-table discussion in the afternoon. His new draft is said to make general proposals for commissions and offices on the three issues under discussion, including a new ‘political and cultural expression and facilitation office’. There is also a proposal for ‘limited’ immunity from prosecution for those dealing with a new ‘commission for information retrieval’. The commission is to be set up to take over responsibilities from the police Historical Enquiries Team (HET) and others. But the detail of that idea, and how it could permit a truth recovery process, remains unclear. Negotiations are set to continue next week, it was confirmed tonight. One reported ‘side deal’ from London which might encourage unionists on the issue of cultural symbols involves Hillsborough Castle, the site of the original peace process negotiations in 1998, becoming an official British royal residence. There was also a report -- albeit denied -- that the shelved development project at the site of the former Long Kesh H-Blocks prison site will again feature in the Haass discussion documents. Meanwhile, Ms Ni Chuilin criticised comments by British Direct Ruler Theresa Villiers on Wednesday that the British government was not prepared to ‘pick up the bill’ for dealing with the past. The British cabinet Minister said the annual subvention paid to the Stormont administration from the British exchequer was already “very substantial”. “That intervention by Theresa Villiers is unhelpful,” Ms Ni Chuilin said. The British government will know that they will have to provide both funding and legislation “so it’s a bit of a naive comment”, she added.